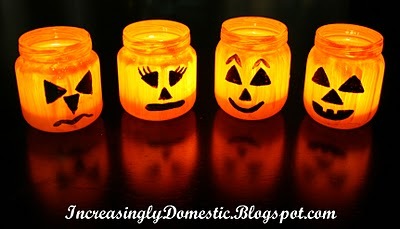 Below are some pictures to show you a few ways to reuse your old baby food jars. 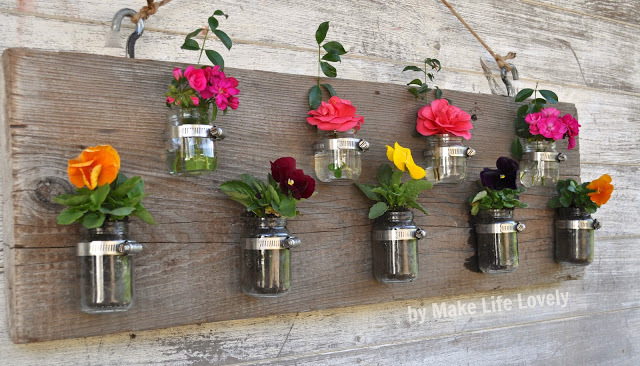 I hope these ideas inspire you to do something with all those old jars you might have hanging around. 2. Store office supplies like markers, pens, pencils, staples, push pins, etc. These look cute sitting in a row, filled with different things on a desk/craft table. 3. Store small craft items like jewelry making supplies and scrap book supplies. 5. Keep measuring and baby spoons organized. 6. Pack a little snack and save your zip locks. 7. Store hair clips, pony tail holders, and bobby pins, so you stop losing them like I have been. 8. Store your kitchen spices in the jars. I used a chalk marker on this one. 9. They can be used as tiny planters. 10. I used a baby food jar to store my homemade vanilla extract. 11. I also store small batches of salad dressing in them. This is my homemade honey mustard. 12. They make the perfect, little vase. I love the way it looks when you have several of these lined up in a row. 13. They make nice gifts if you dress them up a bit. I gave this chai tea concentrate away as gifts in baby food jars. 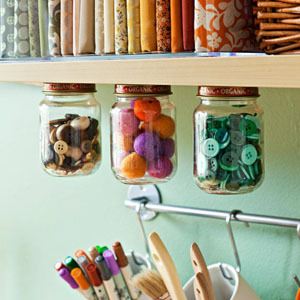 Keep in mind that you can always use a chalk marker (found at most craft stores) to label the jars or the jar lids. I painted the lids you see below using acrylic paint (not dishwasher safe). You can also paint the jar tops with chalkboard paint to use the chalk markers. Below are some ideas I wanted to share that other people have come up with which I love. I sourced the original sites where I found each picture if you'd like to check out how to create one of these neat projects. You can use magnets or screw the lids under cabinets and shelves. Picture source found here. Perfect for a wedding! Picture source found here. This would make a great Mother's day gift. 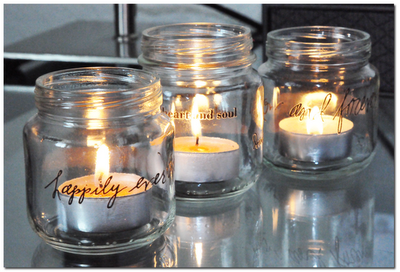 These jars can also be used as candle holders. Picture source found here. 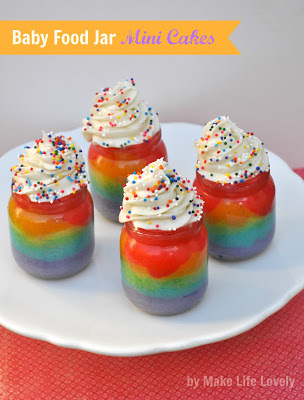 Rainbow cake in a jar. Picture source found here. 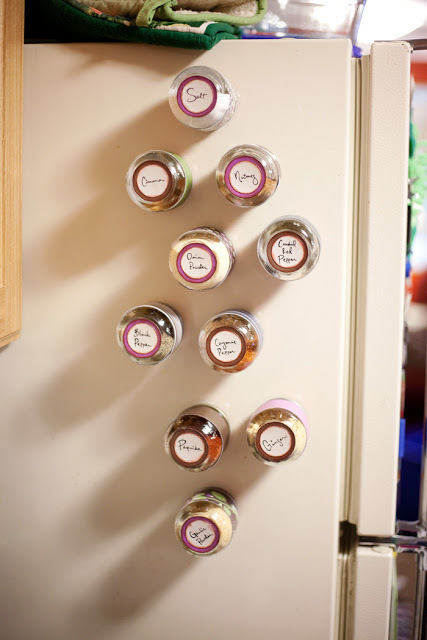 Spice jars placed on a fridge using magnets. Picture source found here. I'd love to make these next Fall. Picture source found here. I would love to hear any ideas that you have for up-cycling baby food jars! Please share your ideas in the comments below. That's a good idea to use them for the freezer jam...and that's also a lot of jam!! 30+ women! I'm headed over to check out your blog now :) Thanks for stopping by. Great ideas! Lots of different ideas! I love using them for spices! Amazing!Such a large number of truly neat ideas.I am going to get my daughter to begin sparing me her baby food jars.I love the pretty spice jars,the magnetic spice jars, and candle holders.Much obliged to you for sharing all these heavenly ideas.